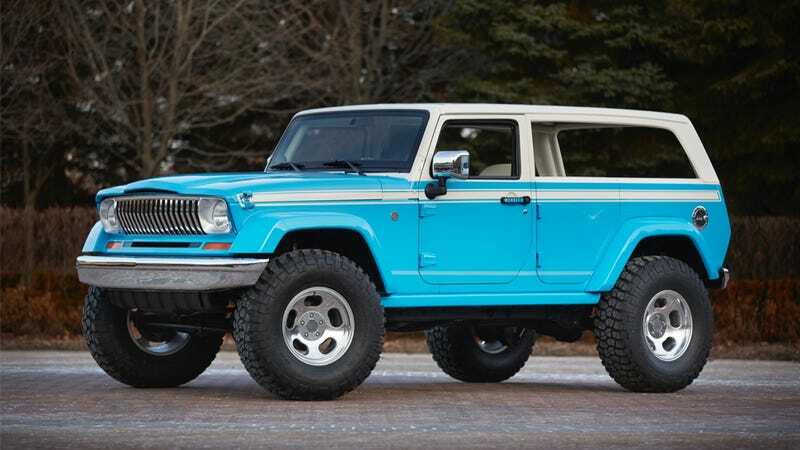 Meet the Jeep Chief concept; a Wrangler-based redux of the classic Cherokee Chief. It's a perfect port of Jeep's 70's style onto their modern platform. Under that surfer-style exterior are Fox shocks, Rubicon rock rails, and Dana 44 axles to make this one all-around amazing conversion. Jeep calls the top a "French Bread roof," which I'd never heard of but I'm definitely digging it now. Side are completely removable and the "razor" grille that looked so great on the original Wagoneer lines right up. Inside they went a little nuts with the "tiki" interior; fitting pink, blue and white flowered cloth and leather-trimmed seats. Retro stickers are a nice touch, though. A Uconnect 8.4-inch touchscreen media center is the most modern-looking thing inside, contrasting a wood-trimmed cargo area. What truck doesn't look good with wood?! The Chief has a 2" lift to accommodate giant tires and the Wrangler's regular Pentastar V6 paired with a six-speed manual. Jeep told Road & Track "it's fully functional." Anybody else think it looks a little bit like a Scout II Terra from this angle?